I’m perhaps what you could call a late starter to the animation industry. It’s been about seven years since I took my first step into this wonderfully strange and dysfunctional world that is the animation and kids entertainment business. Prior to that, I was an office suit holed up in a cubicle surrounded by diagrams of Internet protocol virtual private networks that I had to sell to corporations. It’s sad that the first job out of university is the one that kills your soul. But of course I found out later that your first job is not meant to be perfect, but to get you that membership card into the club known as ‘working life’. And the key to ‘working life’ is not about making a living per se, at least not unless you have a family to support, in which case it is rightfully your priority. Everyone’s got a short window of opportunity to find out what is it he or she wants to do, and preferably it’s something they’re good at or have a passion for. Jobs are like relationships. Each one is a rehearsal for the next one that comes along, and you do better and better each time, until finally you hope to settle on one that will carry you through the rest of what is a very short time on this earth. Sometimes people don’t always find what is it they want to do, or are good at. Just like some people may never find true love, sad as that may seem. The difference is that looking for the right job probably relies more on will and determination, whereas matters of the heart, I think, come down to fate much more than to will. Still, both require a good amount of self-discovery, growth, and maybe maturity. Luck plays a part of course, but I do believe one makes his own luck. It’s been said that love is like a butterfly – the more you pursue it the more it eludes you, but if you are calm and still it will land on you shoulder. Needless to say, that won’t apply to looking for a job (sorry to kill that romantic imagery). It’s interesting to draw the parallels if only because our work and relationships define largely who we are, how we live and why we are here. While my early years in animation were largely focused on learning about the business and discovering how cartoons actually get made, the remaining four years or so also saw me tackling creative development, and sometimes walking that harrowing fine line between art and commerce. At the suitably balanced age of 36 (whatever that means), I’m wary enough – maybe even cynical – of the entrapment of naivety or creativity as a self-indulgent enterprise. But the business of telling stories is really like no other. It’s laborious, frustrating, excruciating, physically and emotionally sapping, confidence shattering, soul crushing, sometimes humiliating, and that could be even before a single frame has been animated. Take it from a development executive. It’s true. But the reward – or the promise of a reward – if a story has a chance to be told, or a series has a chance to broadcast, or a film has a chance to be screened to an audience, could be so fulfilling that even if such an outcome occurs just once, that might be enough to make the years of hardship that came before worth it. That, in its essence, is what we yearn for in this business, I think. I don’t think most creators do what they do because they think they’re creative or they know what others want. The best an artist can do is to tell a story that resonates with and moves him as a person, and if he does so with enough truth, empathy and understanding of relationships as only his life’s experiences could provide him, then he will find an audience, even if it’s just one person who might be moved or changed by his tale. That could well be enough for some of us trying to leave this world a better place than it was when we found it. – Quote from a random Disney artist. 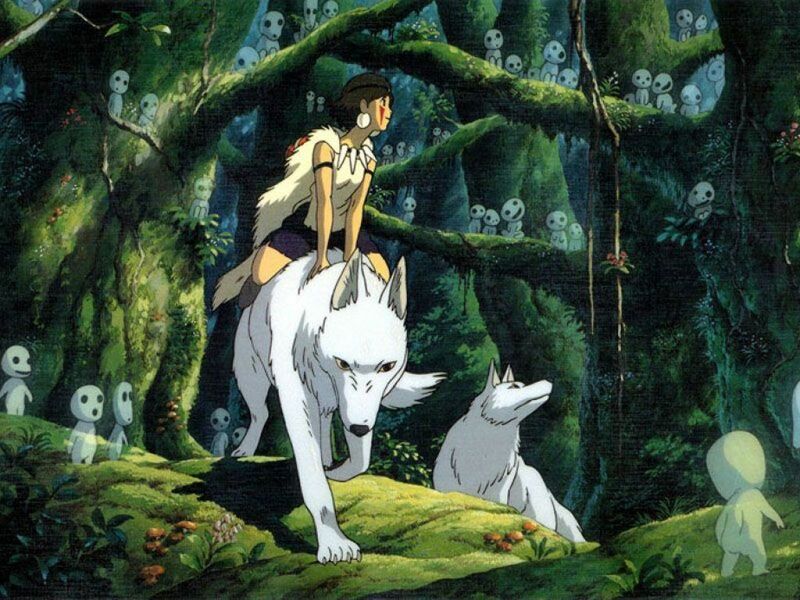 Image above from Hayao Miyazaki’s Princess Mononoke, my favourite animated film of all time. This entry was posted on Saturday, September 3rd, 2011 at 11:15 am	and posted in Retrospective. You can follow any responses to this entry through the RSS 2.0 feed. Well said; great column. Storytelling is indeed a profession unlike any other.